Snippets of Jack: "Do I look like a man in charge?" "Do I look like a man in charge?" 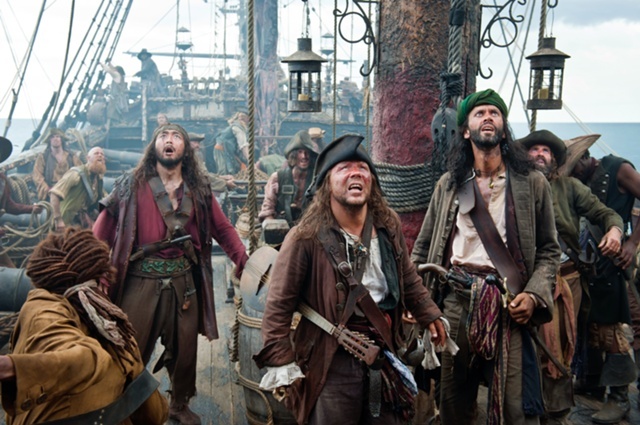 The crew of the Queen Anne's Revenge was very diverse, as you can see in the Pirates of the Caribbean: On Stranger Tides. At the very top of the leadership pyramid of the ship is the captain, who of course is Blackbeard. Although we don't see him on deck giving orders for a while, he is clearly in charge when he wants to be. His infamous Sword of Triton which pretty much countrols anything on the ship is pretty handy in getting everyone to listen to him because when the crew tries to act out (like committing mutiny), he can use the ropes to hold them down. Not to mention the deadly greek fire cannons he has on his ship that allows him to fire at his enemies and his crew. Blackbeard: "If I don't kill a man every now and then, they forget who I am." 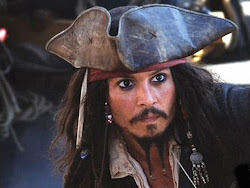 Next in line of power comes his first mate and daughter, Angelica, and Jack Sparrow, who is just as important to the quest as he has valuable information. 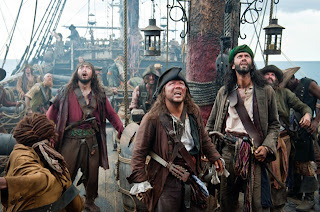 Angelica gives most of the orders on deck when Blackbeard is passed out drunk in his cabin. However, when Blackbeard once something done, Angelica has to agree to it. Jack also has power since he can manipulate Blackbeard into certain agreements (like the exchange for the chalices), so Jack is definately higher up than any normal crew member. Another character who does have some power on deck and isn't treated like part of the crew is Philip Swift. He was captured in a previous raid but since he's a cleric, Angelica insisted on sparing him. For a while they just tie him to the mast, instad of making him work in the crew, but then they kinda just let him walk around wherever he wants and fall in love with mermaids. Now, Angelica is first mate and gives most of the orders, but as she is a woman, she needs some help to impletment her demands. That's where the zombiefied by the Greek fire so that they could be tougher and more authoritative, and uglier. They are rude to all the crew, including Jack (I know, how disrespectful). Scrum: "He's been zombie-fied; Blackbeard's doing. All the officers are that way, keeps them compliant." Jack: "And perpetually ill-tempered." One of the quartermasters could even fortell the future. Sounds cool, except that zombies their minds are set to carry out Blackbeard's commands. Finally, at the bottom in command is the Motely Crew, who virtually have no say in anything. For a while, they didn't even know who their captain was. Unlike Jack, most of them were not knocked out and forced on board. Scrum: "Many a man's woken up at sea, no idea what, when, wherefore or why. No memory of the night afore whence he signed up and drank away all his bonus money." So I suppose they all just got drunk and joined the crew without realizing it. Jak convinces them into thinking that they are not actually on the Queen Anne's Revenge, but if that were the case, how would there be zombie quartermasters? I don't know. Some of the members of the motely crew include Gunner, Krum, Salaman, Ezekiel, Garheng, Cook, and of course, Scrum. Now, porbably at the lowest of the low are their prisoners, which they hardly ever take except for Syrena, the mermiad. They only keep her alive because they n eed her tear, but once they've got it, Blackbeard leaves her to die, like the super kind-hearted person he is. The crew of the Queen Anne's Revenge is a bit different than the crew of other ships like the Black Pearl, but we still enjoyed watching them!